Summary Statement should be short paragraph form or bulleted statements, containing only several sentences. Your summary should begin with a headline that summarizes your professional title and/or your professional statement. When you want to get even more specific on your resume, consider using a resume profile. It's a section of a resume that includes a brief summary of your skills, experiences and goals as they relate to a specific job opening. A well-written profile can show the employer, at a glance, why you are qualified for the job for which they are hiring. 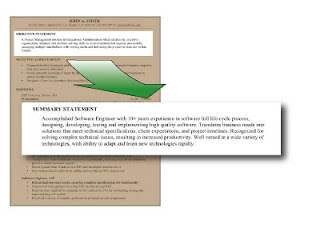 public relations, develop separate resume summaries for each of the objectives. A summary can also contain a brief bulleted section highlighting only a few vital competitive skills that you bring to the table. How many years of career experience do you have? What areas of expertise make you stand out from your competition? What are your most significant accomplishments in your career? Do you have earned any awards or special recognition in both your career and education? What specific knowledge, ability or unique skill do you have? How can you help to improve company performance?